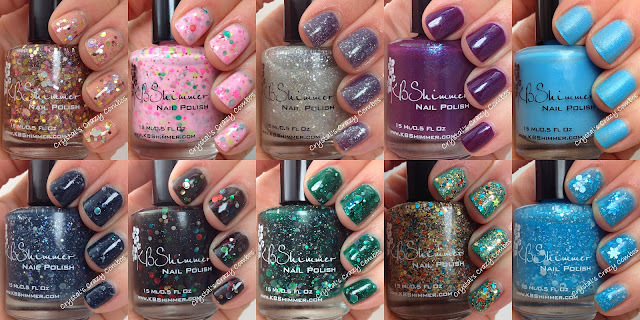 Crystal's Crazy Combos: KBShimmer Blogger Collection 2013 and Giveaway! Each polish retails for $8.75, and comes in a full sized 15 ml (.5 oz) bottle. These polishes will be released on 11/1 on KBShimmer. In addition to the new polishes, KBShimmer will also be offering free priority shipping through 12/31 for all orders over $50. For international orders, Harlow & Co. offers free shipping for orders over $50 within Canada and to the US, if you're international shipping is FREE on orders over $75 (but not more than $300). Hello Everyone!! I'm so excited to share the KBShimmer Blogger Collection with you today! You've already seen my shade, Christmas Now! If you missed it, you can see that HERE!! I'll include the information of each shade given from Christy, which explains each blogger's idea behind the polish! The formula on all of these was fantastic! Get ready for a huge post, oh and a giveaway at the end too! Champagne goes hand in hand with so many winter celebrations, that it was no surprise that I was asked to capture the spirit of a glass of bubbly. This clear glitter topper is loaded with glitters in shades of gold, silver and pink. Circle and hex glitters from micro to large give this polish is sparkling look. This is a glitter packed, thick polish, so one dabbed on coat is recommended. We think it looks great over Plum Tuckered Out. You can find Valesha at http://www.peachypolish.com/. Since Valesha is such a peach, just like her name, that's the shade I decided to use as the base! I used Carrigan by Pretty & Polished. I will be reviewing this soon! This is 2 coats with KBShimmer Clearly on Top. Carrigan is available at http://www.shopprettyandpolished.com/..
What a fun polish, full of circle glitters, holo, and sparkle! It really looks stunning in person! Next, I used 1 coat of Toast-ess with the Mostest over Pretty & Polished Carrigan. I finished with Clearly on Top. Cris has a history of Merry Pinkmas posts on her blog, so what would be a better fit then a pink Christmas polish! This light cotton candy pink polish features red, green and neon glitters. Best in 2-3 coats. I used 2 coats along with 2 coats of Clearly on Top to make sure it was smooth! You can find Cris at http://www.letthemhavepolish.com/. Such a fun pink full of colorful glitters! Living in Arizona, Sarah does not see much snow, so this snow inspired polish will have to do! Shimmering white flakes are set in a clear base. Holographic glitters in small sizes mimic the sparkle you get from snow. Layer this topper over any color to add sparkle and shimmer. I started with 3 coats of Isadora by Pretty & Polished, which will be reviewed soon! You can buy at http://www.shopprettyandpolished.com/. Then, I added 1 coat of I Only Have Ice For You and 1 coat of Clearly on Top. I felt like this could be a snowy winter's midnight mani! I love these two together. Rich, warm colors are always winter favorite, so I was very excited to create this plum inspired polish for Shelia. This warm color has a rich base with blue undertones. A blue shimmer really comes alive when the light hits the polish. This polish covers well in two coats, and the tone deeps with 3 coats. I love this combo of purple with blue specks! I used 3 coats along with Clearly on Top. You can find Sheila at http://www.pointlesscafe.com/. I’d Rather Be With Blue is a matte polish that represents the bright blue sky on a crisp, clear winter morning. This is the type of morning perfect for making a snowman with your family and having snowball fights! A subtle iridescent shimmer sparkles like the snow. Best in 2 coats. I used 2 coats for this beautiful matte! In person it wasn't as sheer as my photos make it seem, but a third coat wouldn't hurt either ;-) And with Clearly on Top below, I love it glossy as well! You can find Lisa at http://www.cosmeticsanctuary.com/. Christmas Eve holds a special place in Chelsea’s heart as that is when she got engaged! To represent that event, Chelsea wanted a navy blue creally with sparkling silver holo glitters. Both circle and hex holo glitters give this polish its sparkle and shine. Best in 2 coats. I used 2 coats of this stunning creation! I am so in love with all the sparkle to this! So hard to capture, but in person it was gorgeous! You can find Chelsea at http://www.the-nail-network.com/. Strung Out is a black jelly polish with circle “light” glitters. Metallic glitters in gold, sliver, green, blue, red and fuchsia sparkle against the black base, just as holiday lights sparkle against the night sky. Best in 1-2 coats over black. It will layer at 3 coats, but will be a bit lumpy. For Strung Out, I used 2 thick coats along with 2 coats of Clearly on Top. Mr. CC really loved this one!! And I do too, as the circle glitters are SO cool in this black jelly! You can find Jackie at http://candycoatedtips.blogspot.com/. Green hex And Glam was actually a custom polish for Kayla’s 3 year blogaversary, but I knew it would also be a perfect Christmas shade! She wanted a green version of I Got A Crush On Blue. I recreated that custom, with a deep green jelly base. I then loaded that base with silver holographic hex glitters in sizes from micro to extra-large for an ultra-sparkly polish. Best in 3 coats. Green and Holo HEAVEN! Look at this stunning dark jelly with holo glitters. I'm so in love. I used 2 coats along with Clearly on Top. You can find Kayla at http://www.kaylashevonne.com/. Being a California girl, Jen sees Frosty being built from sand, not snow, so this glitter topper is her twist on a beach born “Sand-Man”. The sand inspired base of this polish is made up of small glitters in gold, white, tan, brown, and grey. From there we added gold circle “sand dollars”, gold holographic “starfish” stars, orange circle carrot noses, and a dash of water in the form of aqua colored circle glitters. This polish is packed with glitter and can be layered in 3 coats to cover the nail line, or used as a topper with one coat. We love it layered over I’d Rather Be With Blue. I wanted to try something different with Sand In My Stocking!! I used Simone by Pretty & Polished, which you can find at http://www.shopprettyandpolished.com/. I used two coats along with Clearly on Top. This will be reviewed soon. I then applied 1 coat of Sand In My Stocking with Clearly on Top. It is such a fun mix that does remind me of sand! You can find Jen at http://www.thepolishaholic.com/. Victoria wanted a polish that represented the first snow, and what better way than with snowflake glitter! This light blue jelly sparkles with light blue holo glitter, white glitters in several sizes and finishes, a sprinkling of micro holographic glitter, and of course, white snowflake glitter. Best in 3 coats or 2 coats over I’d Rather Be With Blue. Please note, the snowflakes are large and a heavier glitter, and though I added a large amount, there might be some fishing required to get multiple flakes on each nail. As Christy mentioned, sometimes bigger glitters sink, so I like to flip the bottle upsidedown for a minute or two before using! It makes it so much easier to get out of the bottle! I used 2 coats of Snow Much Fun along with Clearly on Top. You can find Victoria at http://www.manicurator.com/. I hope you enjoyed this look at the gorgeous Blogger Collection 2013!!! KBShimmer can be found Facebook to keep up to date on new collection release photos, blogger photos, and shop updates. You can also sign up to receive e-mails from KBShimmer, HERE! Also, KBShimmer is on Instagram and Twitter as @KBShimmer! Keep up on restock info for Harlow & Co. on Facebook. Again, Christmas Now and the rest of the Blogger 2013 Collection and Winter 2013 Collection can be purchased at http://kbshimmer.com/ (US) and also at http://www.harlowandco.org/ (Shipping is FREE at Harlow & Co. for orders over $50 within Canada and to the US, if you're international shipping is FREE on orders over $75 (but not more than $300)). And guess what!?! Now you have a chance to win a set of your own! Christy was kind enough to pass along two full sets to giveaway to you, my dear readers! So see below for details and entering!! Best of luck to each of you! Giveaway will start today (November 10, 2013) and end on Saturday, November 30 at 12am EST. Two winners will be notified by email. If a potential winner does not respond within 48 hours, a new winner will be chosen. Following Blog, Instagram, Twitter, and Facebook will allow only one point each, per person. You may tweet this giveaway as many times as you would like, with one point given per day, per person. Open internationally, however I am not liable for any package that goes missing or does not make it through customs. You must be 18 or older, or have the consent of a parent or guardian, to win. These polishes are all so gorgeous in their own way! Great swatches. Beautiful swatches of such a gloriously fun collection! Follow on Instagram is mandatory? A haven't an account on Instagram. Ah, yours is one of my favourites! Green Hex and Spam and Snow Much Fun are also gorgeous, but yours is just so fun! Congratulations on having 1 of the most sophisticated blogs Ive arrive across in some time! Its just incredible how very much you can take away from anything simply because of how visually beautiful it is. Youve put collectively a fantastic blog space great graphics, videos, layout. This is undoubtedly a must-see blog!